We know the VW Atlas looks great when travelling around West Valley, Murray City, and Orem, but what about the 2018 Volkswagen Atlas Interior? When the team at Volkswagen SouthTowne climbed inside the cabin of this capable SUV, we found a lot of features we liked. 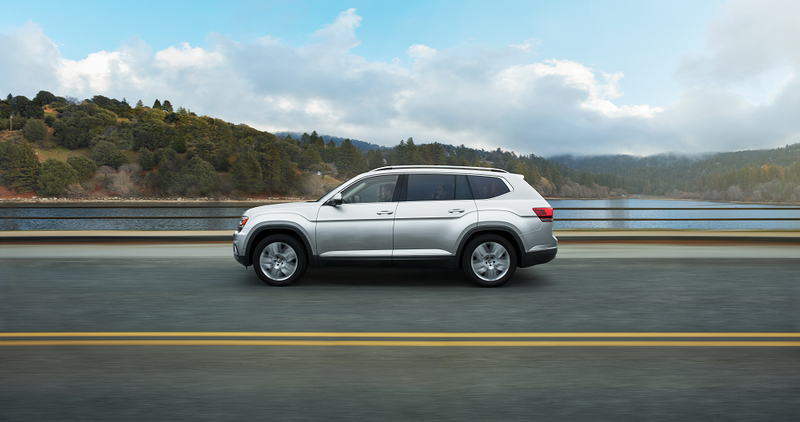 2018 Volkswagen Atlas is a 3-row SUV with enough seating for seven people and a total passenger volume of 153.7 cubic feet. There’s plenty of trunk space behind the third row, and an available Tonneau cover to keep valuable items hidden from site or protected from the sun. However, if you have big items to carry, you can easily fold down the rear seats to create a flat load floor. This space can accommodate a total of 96.8 cubic feet of cargo. The cargo area is easy to load up, as well, thanks to the available Hands-Free Easy Open power liftgate. With the key fob in your hand, simply wave your foot under the rear bumper and the hatch will open automatically so that you don’t have to put down what you’re holding to access the trunk. You can cover your seats in cloth, V-Tex leatherette, or leather in colors like Titan Black, Shetland, and Golden Oak. Learn more about the 2018 VW Atlas in our detailed vehicle review! There are many ways to stay connected from behind the wheel of your VW Atlas. One way is via the available 6.5-inch touchscreen in the center stack. With the standard Volkswagen Car-Net® App-Connect, you can access apps that have been optimized for use with your infotainment system. These apps include internet radio streaming, social media, and weather. You can also fully integrate your smartphone with your car with available Apple CarPlay™ and Android Auto™ compatibility. Once linked, you’ll be able to interact with your phone’s contacts, text messages, incoming calls, music library, and navigation. A navigation system is available with your car, as well. This can display turn-by-turn directions on the 6.5-inch touchscreen, or through the VW Digital Cockpit in the driver dashboard. This available 12-inch screen displays vital vehicle information and can even be operated in a full-screen navigation mode. The 2018 VW Atlas truly goes the extra mile in making sure that every passenger is comfortable during long car rides. Even small details, like available ambient lighting, can help bring this SUV’s cabin to life. With an available panoramic sunroof that spans the entire length of the cabin, you can fill the space with natural light and fresh air. However, when it’s cold out, you might prefer to keep the sunroof closed and activate the available heated first- and second-row seats to keep everyone warm and cozy. As the driver, you can adjust your seat an available 10 ways so that you can find the optimal position for control, comfort, and visibility. Once you’ve found the right setting, lock it in with the 3-position memory feature. With this, you can return your seat to your preferred position with the press of a button after letting someone else borrow your car. If you want to climb inside this SUV and explore the 2018 Volkswagen interior for yourself, come to Volkswagen SouthTowne, near West Valley, Murray City, and Orem. We’ll be happy to take you on a tour of the cabin and even get you out for a test drive.